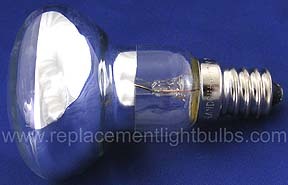 R39 is the glass size, this lamp has a 12mm diameter base. For a 17mm diameter base use this lamp, for a 14mm diameter base use this lamp. If you need help determining your base type click here. Lamps ordered will be shipped the next business day by USPS Priority Mail or UPS. Large orders may qualify for a discount and may not qualify for next day shipment. If you do not know what lamp you require or for lamps not listed below, email your request or call 336-882-2854. To order, please use the secure shopping cart below or call 800-692-3051. Click to go to our Home Page, View Cart and to find Shipping Information. Miniature reflector spot for display lighting, reading lamps, feature lighting etc.